The fan belt is in good condition but the blower motor and blower (or air handler) are not. A leaky float and overflowing pan in the humidifier above the blower motor, are the cause for all this rust. Furnace with induced draft fan. High efficiency or condensing furnace. Furnace fan belt. Gas furnace with induced draft fan (mid efficiency). Furnaced equipped with built-in induced draft fans offer energy savings compared to a conventional furnace. Their electrically operated fans force the combustion by-products through a small vent to the outdoors A chimney is no longer needed. Condensing or high efficiency furnaces have an induced draft fan that eliminates the need for a chimney. In addition, the heat exchangers are larger and more efficient than in a conventional furnace. condensing furnaces is lost to the outdoors. The residual water is drained into the floor drain. Condensing furnaces have either a conventional gas burner burner or a pulse combustion burner. The pulse combustion burner is located in a specially designed combustion chamber. It burns gas in a constant series of rapid pulses that force combustion gases through the heat exchangers which then transfer the heat to the house. A condensing furnace with a pulse combustion burner does not require a pilot light or a conventional burner. Flue gas temperatures are reduced and less heat is lost to the outdoors. Heat exchangers. Gas and oil furnaces may look different but they have many components in common, like the heat exchanger. The flame itself and the by-products of combustion like water vapour, carbon monoxide, carbon dioxide and sulpher, do not come in direct contact with the air being used for heating the house. 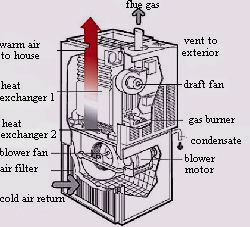 The heat exchanger transfers the heat from the combustion chamber to the air used for heating the house. The heat exchanger is an important part of the furnace. A faulty heat exchanger (cracks or rusted through) can leak combustion by-products (including carbon monoxide) into the distribution or supply ducts. In most cases the entire furnace has to be replaced if the heat exchanger is cracked or rusted through.